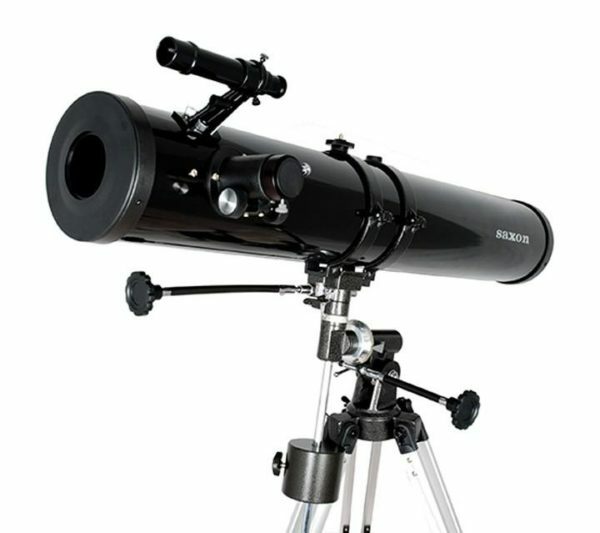 BEGINNER TELESCOPE – Introductory telescope for Beginner level astronomy & those on a budget. Good performance on the moon, planets, stars, double stars & star clusters. Good quality and affordable price! 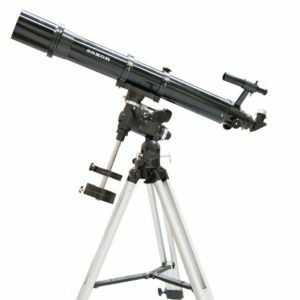 Perfect telescope for beginner level astronomy. Features a sturdy Equatorial mount with slow motion controls on both axes for slewing adjustment. Plus adjustable aluminum tripod with accessory tray and quality eyepieces. Supply includes Saxon Australia 5 year warranty. BEGINNER TELESCOPE – Budget introductory telescope for Beginner level astronomy & those on a budget – Good performance on the moon, planets, stars, double stars & star clusters. 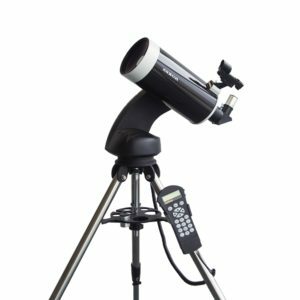 Are you looking for an astronomy telescope that’s excellent for the beginning astronomer or a telescope for a curious adult? 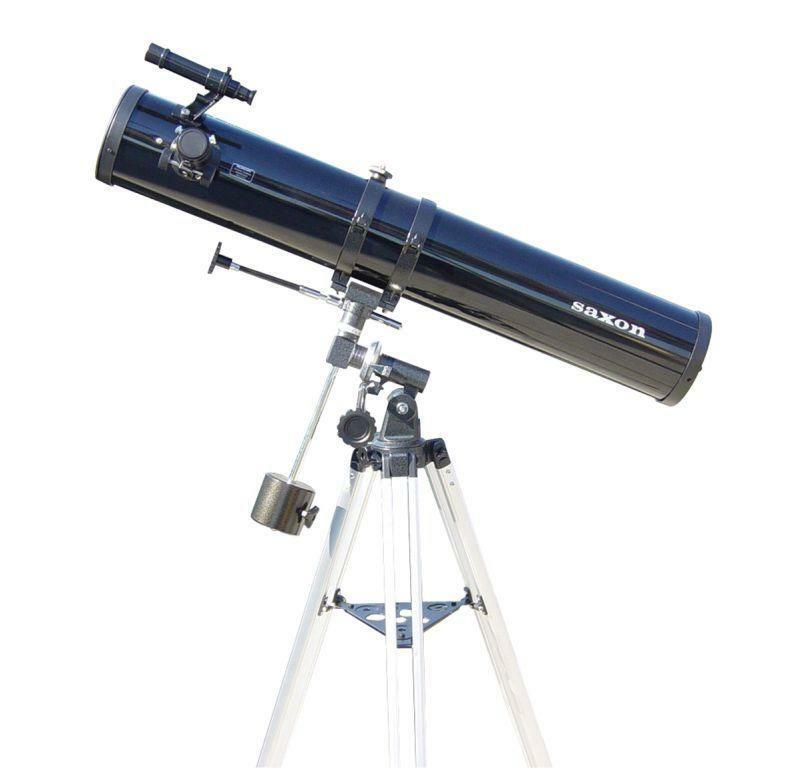 Then take the time to look at the Saxon 1149EQ – 114mm Reflector Telescope system. The Saxon 114mm Reflecting telescope is meant for astronomy. At its heart is a 114mm aluminised and over-coated parabolic mirror housed in an aluminum body It has a 900mm focal length and operates at a focal ratio of f/8. This means the Saxon 1149EQ Newtonian Reflector telescope is capable of reach a limited stellar magnitude of 12.8 and has a practical magnification limit of 337X. 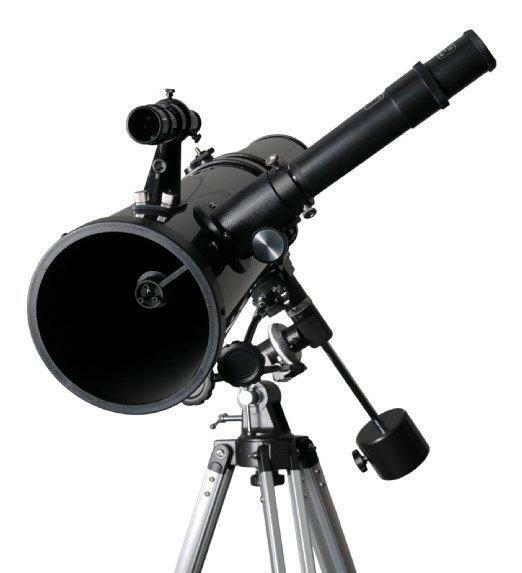 Since light gathering power is important to astronomical applications, you’ll be pleased to know this budget minded telescope gathers 125% more light than 76mm telescope and 165% more light than 70mm scopes. * Colour printed Moon & Solar system chart and astronomical CD-Rom. What can you expect to see with a Saxon 114mm reflector telescope? You’ll enjoy well resolved views of the Moon’s cratered surface and explore its mountain ranges and dark maria. Jupiter will reveal its major equatorial bands, the “Great Red Spot” and the four Galiean moons circling it. Saturn will show it has a ring system and its moon – Titan. When Mars is close, you’ll see dark patches on its surface and the gleam of its polar caps. Neptune and Uranus will show their pale colored orbs. Point the Saxon 1149EQ – 114mm Newtonian reflector telescope towards bright star clusters and watch the stars resolve like bright fireworks. See the vague clouds of distant nebula and take in the light of larger, brighter galaxies. The Saxon 114mm reflector is a great way to spark astronomy interest in anyone – from an older child to a curious adult! For many, this is the perfect sized telescope – meant for a lifetime of exploration and enjoyment. The Saxon 114mm Reflecting Telescope System is ready to go, right out of the box. You’ll get a 5X24 finderscope to help you locate subject matter, and the stable equatorial mount is easy to learn and easy to use. 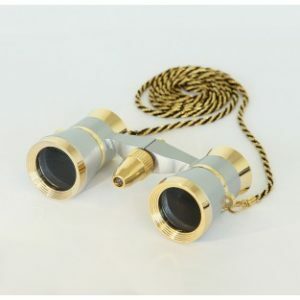 Just add any of the three included eyepieces and it’s time to view. There are charts and software, too!